Gradually, the reputation of Bangladesh as a shipbuilding nation is growing internationally. As the industry grows so does the disputes between the shipbuilders and purchasers. Shipbuilding is a huge investment project involving joint effort and finance from Banks, overseas and local entrepreneurs etc. Local shipbuilders are now involved in shipbuilding works of both local and international customers keeping related service industry busy. Legal service is often very crucial to conduct due diligence as to bank finance, foreign lending, builders and buyers company’s legal health, tax, VAT and customs matters and incentives for such major construction projects. Besides, shipbuilding contract being a complex construction agreement is mostly drafted by a lawyer so that it covers all aspect of local and international laws. Shipbreaking industry alike shipbuilding industry is of vital importance as it produces raw materials to the steel industry, shipbuilding industry, local and south Asian several industries and others. Shipbreaking industry in Bangladesh has emerged rapidly primarily owing to economic labor cost. Shipbreaking industry involves environmental issues, commercial scrap contracts, sale of scrap items, ship breaking industries, personal injury cases, employer’s liability etc. Legal service is paramount to address the aforementioned issues revolving around the shipbreaking industry in Bangladesh. The Chambers is playing a pioneering role in the shipbuilding legal services as it acted for a major foreign ship-owner for a period of more than 07 years and was able to successfully recover their million dollar claim against a local shipbuilder. We represented a substantial German ship-owner, who had ordered four new buildings at a shipyard in Bangladesh. Unfortunately, all these four shipbuilding contracts failed and were ultimately canceled by our clients, which gave rise to very complex legal proceedings in Germany, England and Bangladesh. Mr. Rahman handled various proceedings in Bangladesh for our client against the local shipyard and its financing banks. He did so in a most effective, successful and cost-effective manner. We can therefore highly recommend the legal services of Mr. Rahman to any party, which needs legal support in Bangladesh in matters relating to international trade, financing and transport. 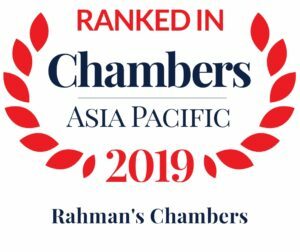 Rahman’s Chambers is one of the very first law firms which handled a few major shipbuilding disputes successfully, between a major ship owner and a local shipbuilder. The Chambers handled several complex litigations in lower and higher judiciary and also litigation arising out of arbitration taking place in London and Germany in shipbuilding matters. 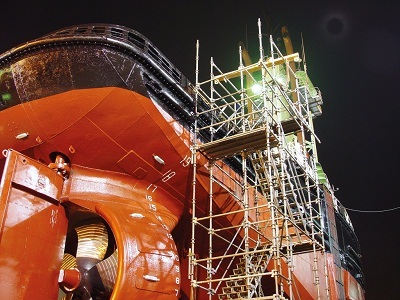 We have deep insight into the laws and regulation and also practical experience of dealing with legal issues, which is invaluable for clients when it comes to shipbuilding matters. The firm has developed expertise in drafting shipbuilding contracts, bank guarantees etc. Ship breaking industry is old in Bangladesh. Since the 1960s the industry has grown over the years. The Chambers acts for foreign buyers of ship items etc. and often advised clients over trade terms on ship breaking. 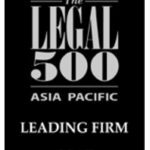 Successfully litigated Admiralty suit between Hyldebrand Singapore Pte. Ltd vs Ananda Shipyard and Slipways Limited over a claim relating to shipbuilding contract. Successfully litigated arbitration petition between Ananda Shipyard and Slipways Ltd vs. Komrowski Maritim GMBH, Germany over drawing of bank guarantee. Successfully litigated a Civil Revision between Ernst Komrowski Holding KG (GmbH & Co) vs Ananda Shipyard and Slipways Ltd over claim involving finance for infrastructure development of builder. Drafted shipbuilding contract between Narayangonj Engineering & Shipbuilding Ltd. (NESL) and Bashundhara Group involving the building of tanker/cargo/LPG vessels at the respective party’s shipyard using yard site, infrastructure, equipment’s, administrative and other services. Provided legal consultancy to Intraco Lines Ltd and drafted joint venture agreement formed between Intraco Lines Ltd and CGFK Trading Co. Ltd. Provided legal consultancy and drafted agreement formed between a major Russian shipbuilding company and a local company involving building and supply of vessel under G2G contract. Conducted due diligence for foreign buyer relating to ship breaking items involving shipbuilding contract.